If you’re planning to hit the pool on hol, getting prepped is important. Why not go for a swim in your local pool to brush up on your breaststroke? If it’s been a while since you last went swimming, it’s definitely worth reminding yourself of the basics. Most swimming schools in the UK offer lessons for all ages, so sign up for a class if you need a confidence boost. And, make sure you leave enough space in your case for armbands and inflatables for little ones. Check out our packing guide for space-saving hacks. When you’re at the pool or at the beach, make sure you’re in the know about the rules and regs. In the pool, take a look at the water depth, especially before you make a splash from the side. And on that note, only dive where signs tell you that it’s safe. You’ll find safety signs at the side of the pool, and it’ll take you a couple of seconds to have a read. Then, you can be smug in the knowledge that you’re swimming safely. Our reps are a great source of swimming pool safety knowledge, too, so ask them if you’ve got any questions. They’re also experts on the area, so if you want to swim in the sea make sure you get their tips on which beaches are safest. Swimming in open water’s very different to being in a pool, as you’ve got extra things to think about, like rip currents, rocks and reefs. Keep an eye out for warning flags and info signs on the sand, and ask a lifeguard, if there’s one on duty. Some beaches have special areas reserved for watersports, too. Keep an eye out for dividers in the water, and stay in the swimming area. As well as being boring, swimming alone can be dangerous. Make sure you keep an eye on whoever you’re with, whether you’re on holiday with your pals, your partner, or your family. You shouldn’t swim if you’ve been drinking alcohol, especially on your own, or at night time. Plus, keep your eyes extra peeled for your kids. Stay close to little ones – they must be supervised at all times, even if they’re wearing armbands or there’s a lifeguard on duty. If you see someone in difficulty, let a lifeguard know straight away, or call the emergency services – google the number and save it in your phone before you jet off. 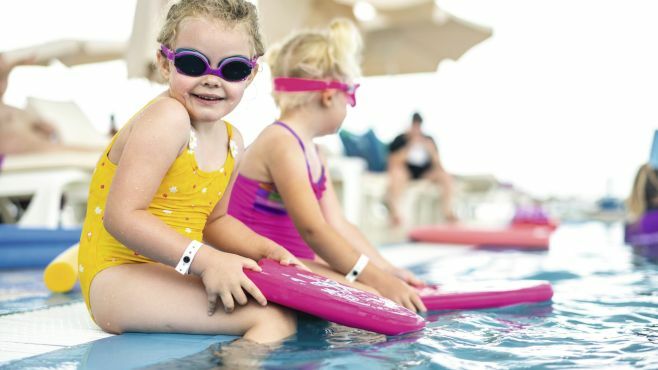 Little ones can learn to swim at our Holiday Villages for an extra fee. The Swim Academies run lots of lessons for different age groups and abilities. 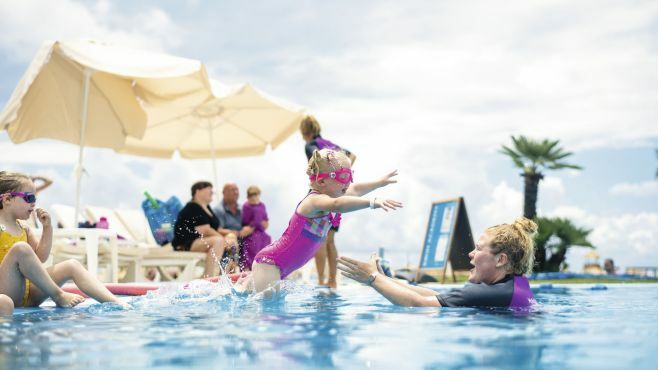 The class size is never bigger than six, so you can be sure that your budding swimmer will get all the attention they need. All our instructors are ASA qualified, to boot. More confident swimmers can have a go at the Rookie Lifeguard classes, too, where they’ll learn the basics in safety in the water. Want to know more? 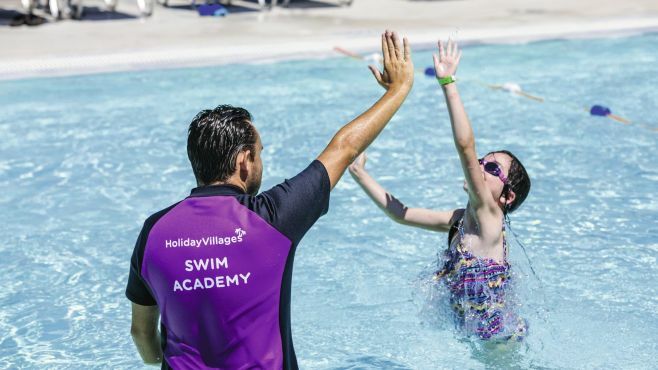 Have a read of our interview with George, an ASA level 2 qualified swimming instructor at Holiday Village Aliathon, in Cyprus. Now you’re all clued up, have a browse of our best deals to choose your swim-safe escape. Take a look at ABTA’s Swim Safe website for more hints and tips. Plus, have a look at ABTA’s videos on pool and beach safety.